Discussion in 'Ammo, Reloading & Accessories' started by Kent Goldings, Apr 17, 2019 at 2:08 PM. I’ve been fighting with my Ruger American 308 for a couple of years now. I’ve tried several loads and even tried an aftermarket stock. But, I couldn’t seem to break the 1 MOA barrier. I forgot finally broke down and splurged for this Magpul Hunter stock. To inaugurate the new stock, I loaded these Hornady 160 gr HPBT match bullets with 45 gr. Hodgdon CFE 223. This was a complete random charge from the middle of the recommended range for a bullet I’ve never used before. 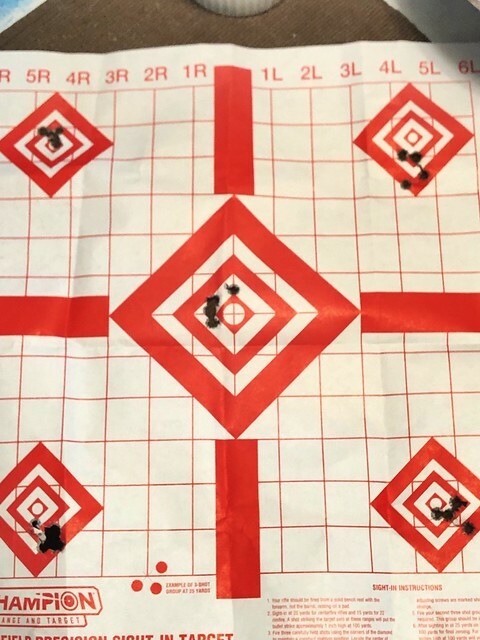 I loaded 20 rounds to test the load and shot 5 4-round groups. The result was the page below. This seems like a pretty consistent load. Twogunwilly, Acer-m14, GOYABEAN and 6 others like this. Those are some pretty good groups you have. Looks like you found a good load for that rifle! Taking deer at less than 100 yards is something I could already do. I’m trying to hit 1,000 yards. If the upper left is the cold bore group, then that load is a keeper! The first group is the center. But, the bore wasn’t cold. I was good and warmed up.